It seems like vitamin C and hyaluronic acid serums are popping up everywhere. I've now tried several; most really add to my nighttime routine, while some irritate my skin or just seem to do nothing. 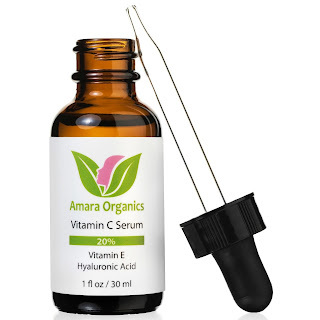 I was asked to review one from Amara Organics, and I think it's a good, middle-of-the-line serum. I love the citrus smell you often get from vitamin C products, but this serum didn't have it and I missed it. That's not to say, however, that this serum smelled bad. It certainly didn't. It has an almost undetectable scent. The serum is also not very thick, so when I first started to use it I felt like I needed to use a lot of product to make sure it was really on my face. I quickly realized that was unnecessary; one dropper full of serum is enough to smooth and firm your skin. One thing I really like about this serum is that it's completely clear, so it works well in the morning. An added bonus is that the serum provides UV protection. -Made using only the best, natural plant-based ingredients available, with no parabens, no alcohol, and no animal testing. Made in the USA.